As I understand it, it goes something like this: The entire Sac-Joaquin Section of the California Interscholastic Federation (CIF) has 49 schools. They are divided into North and South. Davis is in the North section. In each the North and South, there are four different leagues. Davis’s league is the Delta Valley Conference. For the baseball playoffs, the top three from each league advance to a post season tournament. So, in the North’s playoff tournament, there were twelve teams. The top team for each league gets a first round bye. Davis had finished second in league play behind area powerhouse Elk Grove, which meant they had an extra, must-win game to play. Single elimination games continue until four teams remain. Davis won all its games (two or three, I can’t remember) and ended up being one of the top four finishers in the North’s bracket of the S-J section tournament. The next phase of the tournament is a double elimination series with the four remaining teams, which, after a couple rounds of play, was narrowed down to two teams: Davis (2-0) and Elk Grove (1-1). Elk Grove and Davis then went head to head. Elk Grove won the first game, which gave both teams a 2-1 record. 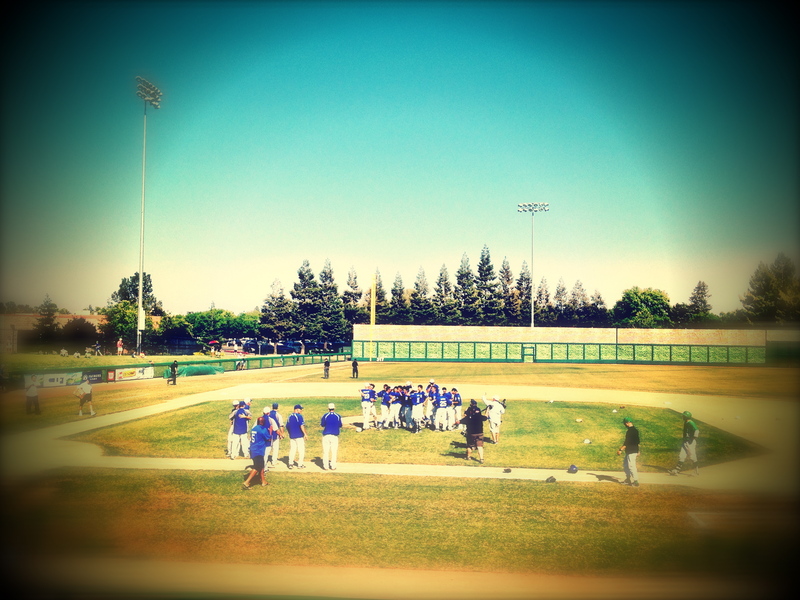 Davis prevailed in their second game to win the S-J North section title and advance to the final, championship round. Meanwhile, down in the South, St. Mary’s of Stockton rose through the ranks in a similar fashion to reach the best-of-three championship series, played at the very nice stadium of the University of the Pacific in Stockton. The series began last night and Davis won 7-4. Today, a double header. Davis lost the first game 1-0. Now the series is tied: Davis 1, St. Mary’s 1. In the third and final game, Davis won 3-2 to take the whole enchilada. Those boys did a great job. Peter and his JV cohort (and lots of the freshmen players, as well) showed up to most of the post-season games in support. That was very nice to see. It will be fun to see what happens in the next two years. Especially fun should Peter make the varsity team.